This funky melon print is a fantastic gift for your Dad, great for his birthday, Father’s Day or Christmas. The vivid, cheerful colours and fun phrase make it the perfect thoughtful and unique gift. It will look awesome on his wall and will always remind him of how much he means to you! Change the name ‘Dad’ to any name you would like and the print is perfect for anyone. The design features a selection of delicious looking watermelons, arranged in front of a zingy green heart patterned background, with the text ‘Dad – You’re one in a melon’. The print is available in 7×5 inch unframed, 7×5 inch framed, A4 unframed, A4 framed and A3 unframed. The A4 and A3 size can be personalised by adding any name into the design (see photos). Please select which you would like and fill in the relevant details. If you choose no personalisation, you will be sent the ‘Dad’ version of the print. 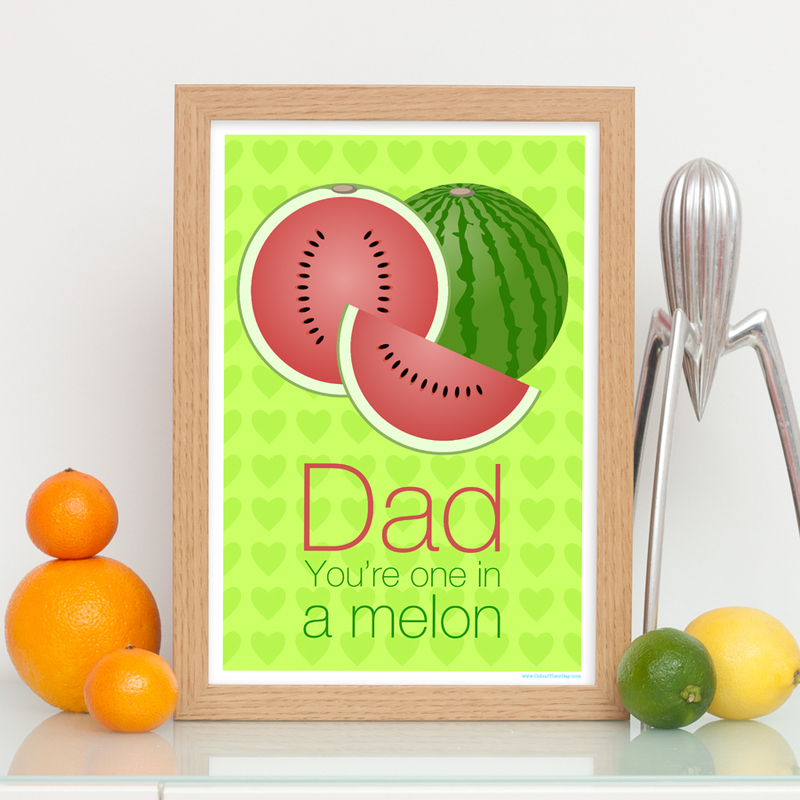 Be the first to review “Dad – One In A Melon Print” Click here to cancel reply.